Recently Stitchcraft Marketing contacted me to see if I would be interested in trying something from JUL Designs, a designer of adornments, accessories, bags and bag handles, and closures to accessorize knitted items. I spent a little while looking at the site, which features various bag handles, leather closures and shawl pins and sticks. 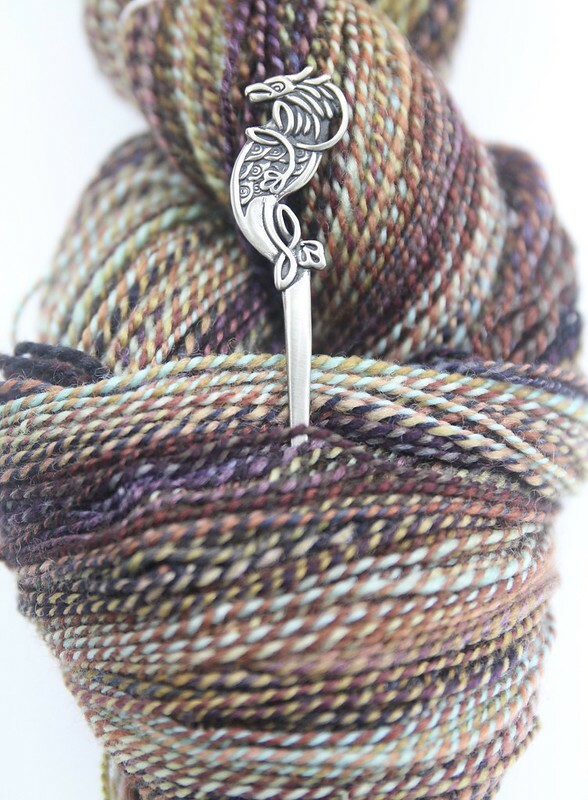 Ultimately, I asked to review a shawl pin and JUL generously sent me their Apus Celtic Bird of Paradise Shawl Stick. When I received the shawl pin, I thought it was very well executed. The pin is made from white brass and hand made through fair trade in Indonesia. 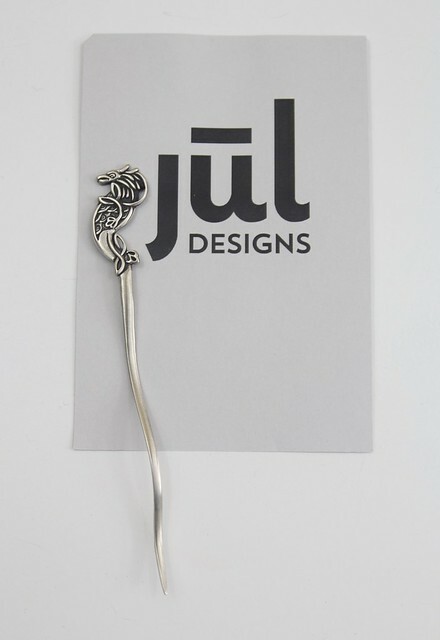 The motif itself is about 3/4″ and the shawl pin is approximately 5 1/2″ in length. The motif is clean cut and I love the shading/aging on the pin. Apus is a constellation in the southern sky that represents a Bird of Paradise. In Greek, Apus means ‘with no feet’ as the Bird of Paradise was thought, at one time, not to have any. You will notice that our Bird of Paradise, as its Greek name indicates, has no feet. Celtic illuminated letters that use animals to create the letter forms are our inspiration for our representation of this noble, footless bird. 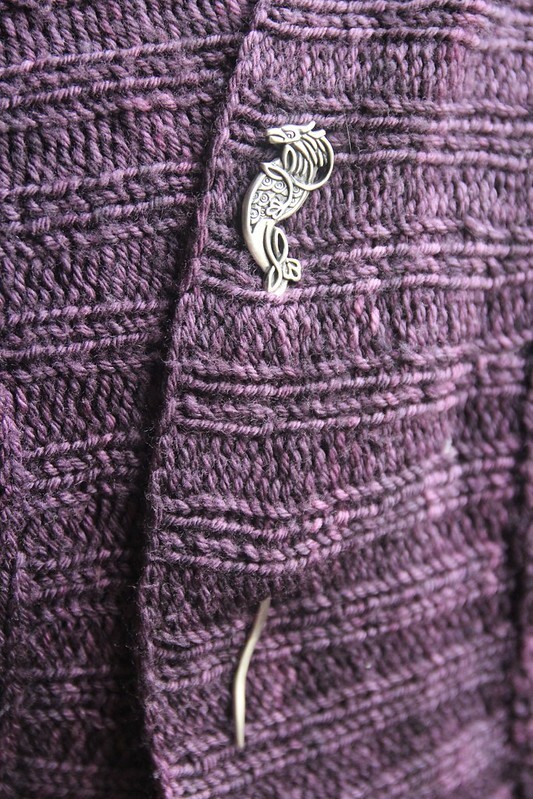 I wanted to showcase how pretty this pin is and also how useful it could be, so I tried using it with a variety of knits. Specifically, I first tried it on a long open-front cardigan that was designed without closures. I do enjoy wearing it open, but I also like the idea of closing it up and accessorizing it with a beautiful pin. I also pulled out my shawls and styled them with the pin. Though I tend to wear my shawls more bandana style, this pin offers a great solution to some of those shawlettes that I have trouble keeping on my shoulders. 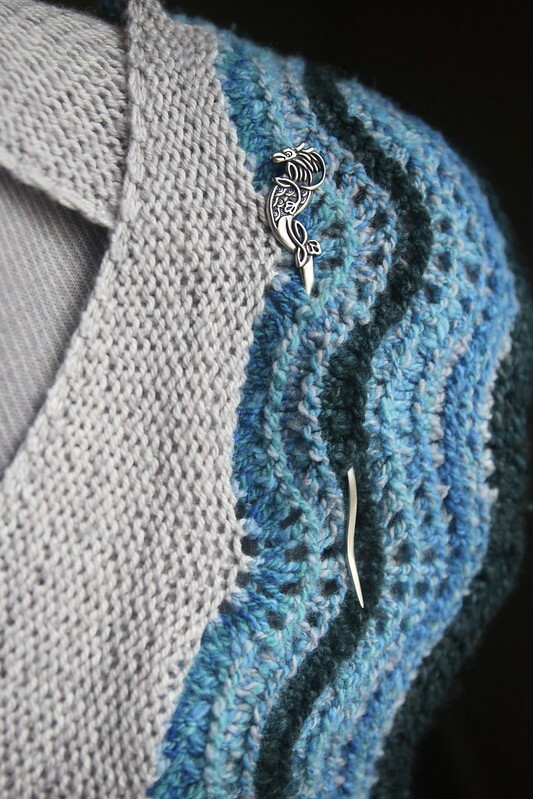 I think the design and color of the pin makes it really versatile so I can wear it with many of my handknits. I look forward to trying it in the coming weeks. Overall, I really liked the pin I received from JUL Designs. It appears to be stylish and well made, at a reasonable price. A special thank you to Stitchcraft Marketing and the folks at JUL Designs who sent me the Apus Celtic Bird Shawl Stick (retail: $22.00) for free. I received no other compensation for this review. All opinions and photos are my own. JUL Designs has sent me a coupon code for you to use. Between now and December 31 use the code “VERVE” and receive 10% off your purchase of the Apus Celtic Bird Shawl Stick.